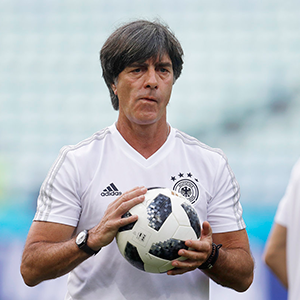 Munich - Joachim Loew has rejected Mesut Ozil's accusations of racism within the German FA as the head coach gave his analysis of Germany's World Cup debacle on Wednesday. "Mesut made allegations of racism, but I can clearly say that in the DFB, there has never been racist comments," Loew said while announcing the Germany squad to face world champions France in Munich on September 6, then Peru three days later. "The players with an immigration background have always enjoyed playing for us and nothing has changed," added Loew who has been head coach since 2006. Arsenal midfielder Ozil retired from international football on July 22 with a stinging three-page statement, in which he accused DFB president Reinhard Grindel directly of racism. "His advisor called me to inform me that Mesut would issue the third part of his statement," added Loew. "The player himself did not call me, which normally players have done in the past. "Mesut has still not called me and for the last two weeks I have unsuccessfully tried to reach him. "He has chosen this path - I have to accept that." When Erdogan's office put out pictures of the meeting, the pair's loyalty to Germany was hotly questioned, sparking fierce debate about integration, and they were attacked by German far-right politicians. Ozil walked away from the German set up after the World Cup, complaining of facing "racism and disrespect" and specifically took aim at Grindel. "In the eyes of Grindel and his supporters, I am German when we win, but I am an immigrant when we lose," Ozil wrote damningly. Following Germany's World Cup debacle, finishing bottom of their group in Russia, Loew announced on Wednesday that assistant coach Thomas Schneider has been demoted to chief scout. Sami Khedira, part of the team which won the 2014 World Cup, is the biggest name casualty in the new squad, which included Gundogan as well as his Manchester City team-mate Leroy Sane, who was dropped for the World Cup.